Donald Trump's campaign manager will not be prosecuted on a charge of misdemeanor battery for allegedly grabbing a female reporter at a Florida rally, the campaign and the Palm Beach County state attorney said. The Palm Beach County state attorney's office said in a document on Thursday that they would not pursue charges against Corey Lewandowski, who was accused by then-Breitbart reporter Michelle Fields of grabbing her arm. The document said that while it was clear beyond a reasonable doubt that Lewandowski touched Fields, it was possible that he may have perceived her to be a threat to Trump, the Guardian reported. The Trump campaign said in a statement Thursday that the matter had "now concluded." 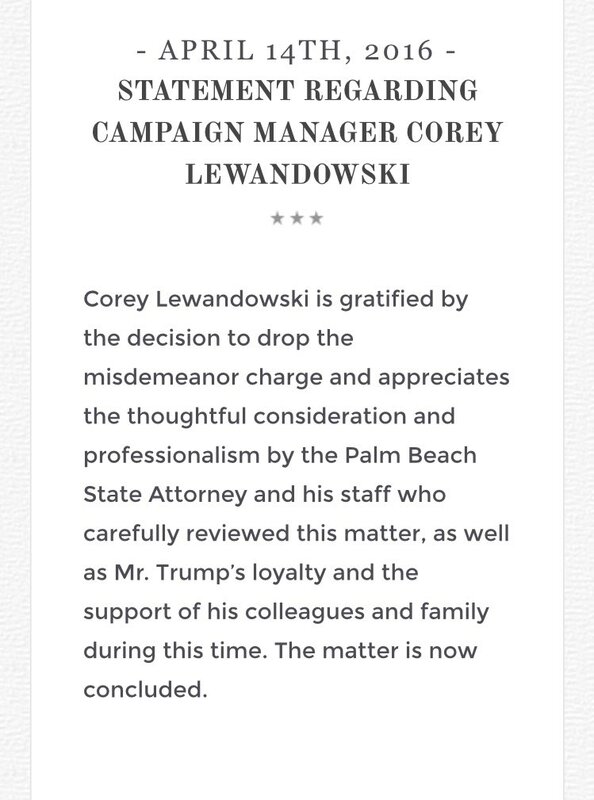 "Corey Lewandowski is gratified by the decision to drop the misdemeanor charge and appreciates the thoughtful consideration and professionalism by the Palm Beach State Attorney and his staff who carefully reviewed this matter, as well as Mr. Trump's loyalty and the support of his colleagues and family during this time," it said in a statement. Fields responded in a series of tweets to speculation on Wednesday that Lewandowski wouldn’t be charged, writing on Wednesday: “Prosecutor's office told me they would inform me of decision tomorrow. If reports true, guess they decided to leak to reporters first. Ugly. “For those asking, office of prosecutor asked 2 weeks ago if I'd be ok with an apology from Corey,” Fields continued. “I said ya but haven't heard back about it." Fields had asked the Republican presidential candidate a question after a March 8 press conference at the Trump National Golf Club in Jupiter when the alleged incident took place. But Jupiter Police charged Lewandowski after they obtained video from the rally that they said corroborated Fields’ claim, saying he “grabbed Fields left arm with his right hand, causing her to turn and step back." According to the Guardian, Thursday's memo said: "While evidence in this case is legally sufficient it is not strong enough to meet the legal burden of a reasonable likelihood of a conviction." He went on to say the tapes showed nothing and attacked Fields’ credibility. During a Wednesday night appearance on the “Kelly File,” Fields told Fox News' Megyn Kelly that she is planning to pursue a civil case against Lewandowski for defamation. Trump supporters celebrated the news that Lewandowski had been cleared, taking to Scavino’s Facebook to offer words of support and congratulations. “It was clear as day Corey was setup to take heat to distract Trump during the Wisconsin primary,” one person wrote. “I knew he wasn’t guilty to start with, just a little opportunist b**** wanting her 5 minutes of fame,” another person posted.